The 5th Turtle has a preview of December's Tales of the TMNT issue. Both "Tales of the TMNT" #36 and "Raphael: Bad Moon Rising" #1 are available in comic shops today. Go check them out! 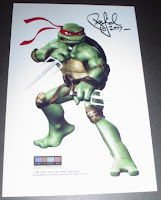 Eric Talbot updates his blog today with a nice Raphael sketchbook painting. Many, many years ago, "The Forever War" was to be the last story arc of the Teenage Mutant Ninja Turtles Adventures title published by Archie comics. But Archie pulled the plug on the series early and the story never came to be. For several years Mirage has been saying that they would complete and publish this story, but it hasn't come to be. Now word comes from Steve Murphy that "The Forever War" will be published as part of the TMNT's 25th Anniversary in 2009. A trade paperback collecting related issues will also be published. Read the full details at The 5th Turtle! Steve Murphy has given and posted yet another interview. No ground-breaking revelations in this one, so I'll just send you over to take a read. Comic Book Resources has published a press release from Mirage Publishing that features previews of several upcoming Tales of the TMNT issues. Thanks to Tristan for the link. “Silent Knight.” It’s the year 2025, Christmas Eve… a forlorn Raphael makes his way through the sewers of Tokyo… and finds an abandoned baby. What should be a simple trip to the local hospital turns into a deadly gauntlet as Raphael and the child are attacked by… The Foot! All-out ninja action issue! Cover by Jim Lawson and Mike Dooney; stories by Jim Lawson, Ryan Brown and Peter Laird; art by Jim Lawson, Ryan Brown and others. Treasury Edition reprint collecting the entire original Vol. 1 run of Eastman and Laird’s Tales of the Teenage Mutant Ninja Turtles… plus an all-new, never-before-published full-length story and all-new frontispieces by Jim Lawson! Includes the first appearance of the Rat King, Leatherhead and many other characters! A TMNT classic! Diego Jourdan has posted a preview of page 8 from Tales of the TMNT #40 on his blog. 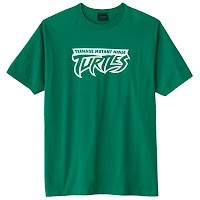 Kohl's stores now have available two t-shirts featuring the 4Kids TMNT logo. 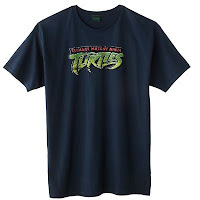 You can click on each picture to go to a link to purchase the shirt at Kohls.com, but you might be able to score a significant discount if you wander down to your local store. Thanks to ToTheNines for the links. Murphy has posted a new, fan-conducted interview over at The 5th Turtle. We should know this Friday (July 13) whether or not Imagi (animation studio) and Warner Brothers/Weinstein Group (distribution) plan on going forward with a sequel. All I know about TMNT V. 4 is that Peter Laird (its writer and creative guru) hopes to return to working on it by the end of the calendar year. At least that’s what I heard this morning from our CEO. Given the way Mirage Publishing is going, I would doubt very much that we’ll ever see The Forever War storyline (from Archie’s TMNT Adventures) getting published. Here's a look at the Panel to Panel exclusive bookplate that is tipped into their copies of TMNT: The Collected Movie Books. If you're not aware, Panel to Panel has offered an exclusive bookplate for each Collected book that Mirage has published in the last year and they will continue to do so with new books that are released. Each bookplate features brand new art (with the exception of the one shown here, which is obviously style guide art from the new movie) and is hand signed by at least the artist and sometimes one or more additional people. They make for very unique additions to your TMNT comic book collection. 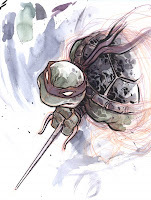 Newsarama has posted a new interview with (outgoing) Tales of the TMNT editor, Steve Murphy. I've quoted what I found to be the most interesting chunks of text below. You can read the entire interview here. Tales will continue to come out monthly, the trades will continue quarterly, and we'll continue with our yearly solo-Turtle mini-series projects. At least through the end of 2008. 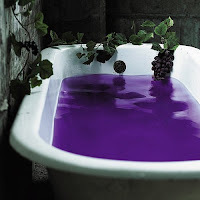 After that, things are, well, rather murky. As Jim Morrison sang: "the future's uncertain, and the end is always near." How's that for being cryptic? I've recently begun negotiations with a publisher of trade paperbacks who does have distribution into the chain bookstores. While the deal is not signed yet, should it come to be, they would be coloring and publishing collections of Mirage comic books, most likely the current run of Tales. From where I am right now, the future looks... mixed. While plans are underway for a new direction for the cartoon show in 2008, we still do not have a green light as to a movie sequel. 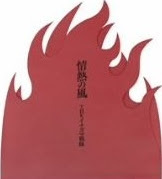 Comics will be published at least through the end of 2008 (as noted above). To our double-headed licensing stream of cartoon-based and movie-based, we will be actively pursuing what we're calling "retro," which is a third licensing stream, one that's based on the classic TMNT cartoon. As far as the future of Mirage itself, only time and Peter Laird will tell. In addition to looking at the magazine, a break is taken to make Fruited Mutant Pizza. Thanks to sdp for the link. 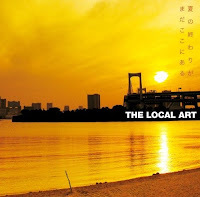 Thanks to Mendinso for the video and to Gobo for tracking down the CD info. Murphy has posted page 1 from Tales of the TMNT #40 over at The 5th Turtle. AVAILABLE EXCLUSIVELY AT PANEL TO PANEL.NET! AN EXCLUSIVE IMAGE, CREATED BY KEVIN MUNROE'S CG CREW, WILL BE SIGNED BY PETER LAIRD AND TIPPED INTO EACH AND EVERY COPY OF TMNT: THE COLLECTED MOVIE BOOKS (FOR A LIMITED TIME ONLY)! 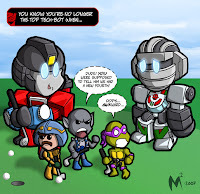 Donatello makes a cameo appearance in today's Lil Formers web comic. Thanks to MikeyLikesIt for the link. Tristan Huw Jones has posted two sample pages of an upcoming TMNT Fast Forward comic in his blog. The comic will be published in issue 4 of the UK TMNT Fast Forward comic magazine, scheduled for release in August. Click here for info on the magazine. Send me an email if you're able to actually subscribe to it.